Ryan Filgas The theatre lobby. Courtesy of Eureka Theatre A 1946 photograph showing the intact sign. 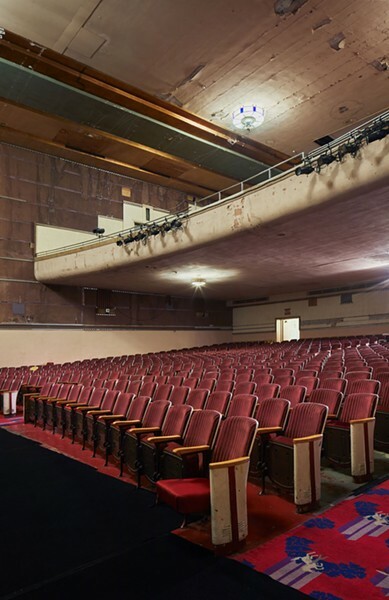 Architect William B. David brought the Streamline Art Moderne style to the North Coast, designing gorgeous theaters in Marin, Arcata and Eureka. Ryan Filgas Restoration in progress. Ryan Filgas Wendy and Chuck Petty at the ticket booth. It was another one of those gilded ages, when Americans were lifting themselves out of economic depression and getting on with prosperity and excess. In 1939 Streamline Art Moderne designers rolled out the art deco New York World's Fair, the aerodynamic GM Futurliner and the soaring rounded towers of Emerald City in The Wizard of Oz. That was the year theater magnate George Mann brought a piece of Hollywood red carpet to Humboldt Bay by opening his ritzy, neon-lit Eureka Theater at Sixth and F streets. Hoist those huge cans of 35mm film in the dumbwaiter up to the projection room! Fire up the carbon-arc projectors — it's showtime! 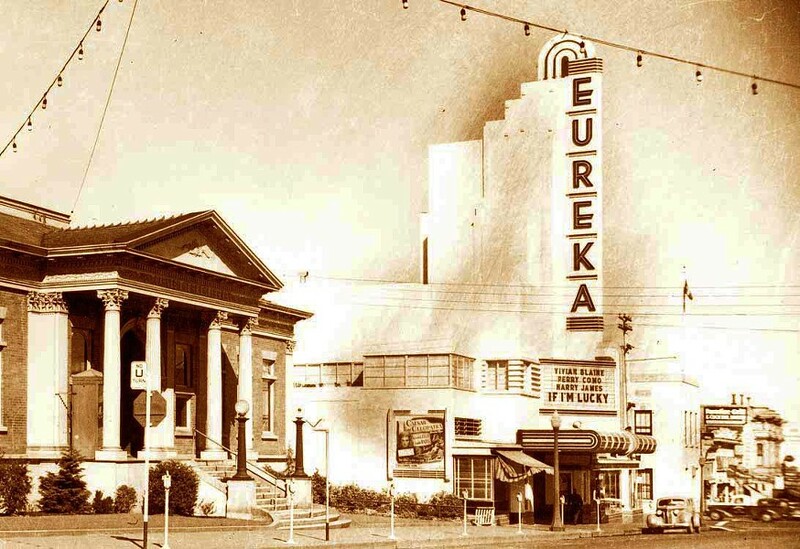 Fast-forward nearly 80 years and we find a small group of valiant preservationists raring to restore the theater — and downtown Eureka — to its former glory. "We want to make going to the movies a total experience," says Wendy Petty, the resident antiques dealer on the Eureka Theater board. "It's not sitting in a crowded multiplex with a $95 popcorn — it's a big-screen, social experience." Her husband Chuck agrees and is heading the restoration committee. "We have a dedicated group who loves these old movies. We grew up here and we want to bring it back." The Eureka Theater was cut up into a triplex in 1978 and ended regular first-run features in 1996 in the face of multiplex competition. Richard Mann, son of the original Eureka Theater owner, donated the building to the nonprofit Eureka Concert and Film Center in 2000. Saddened that the theater's 50-foot vertical blade sign and ocean liner-like monument* had fallen into disrepair, Wendy joined the theater board in 2005 and brought Chuck with her. When he wasn't managing pathology services for St. Joseph Hospital, he was battling for hometown heritage on the Eureka Historic Preservation Commission. He even taught himself how to repair the Eureka Theater's carbon-arc rod lamphouses and thread vintage films. Like its multiplex conquerors, the Eureka Theater went on to make more money at the concession stand than at the box office. The board even installed a digital projector in 2013, when the industry nailed down the coffin lid on 35mm prints. Now armed with the original blueprints, color schemes and most of the vintage fixtures, the Pettys are poised to take this multi-purpose events center — available for classic movies, live shows, group meetings and other community events — to the next level. But there are some hitches. First, nobody in Humboldt County deals in theater construction, which includes the neon lighting and reengineering the blade sign, diagonal marquee and monument structure. A local engineer has bid on the design phase and the hunt for a suitable local builder continues. Second, the board has some money but not enough. Preliminary estimates for roof repairs, painting, plumbing, heating and air conditioning, and interior renovation run between $4 million and $5 million. Looking toward an 80th anniversary next March, the group has several fundraisers planned, including its series of movies filmed in the Redwood Region, co-sponsored by the Humboldt-Del Norte Film Commission. A Kickstarter campaign to restore the Streamline Moderne exterior is ready for launch, too, as soon as the theater board can determine the costs. The Pettys also envision some black-tie affairs in the theater's upstairs apartment, just recently vacated by the elderly tenants of 29 years. Original owner George Mann used it as lodging as he made the rounds of holdings from Dinuba, California, to Klamath Falls, Oregon. 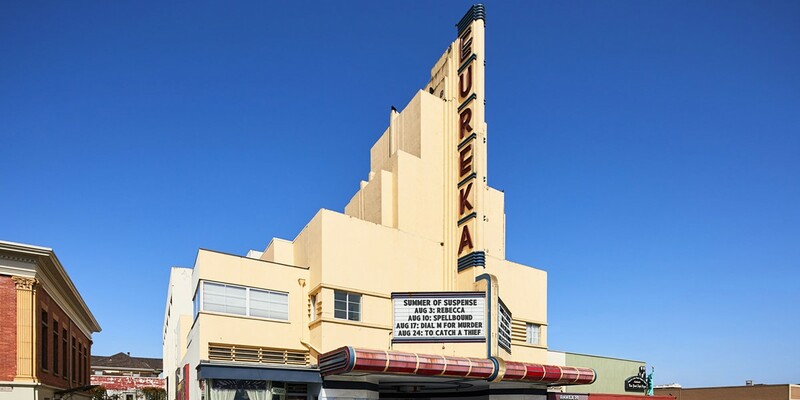 The art deco tiling, curved doors and skylights will bring another piece of Hollywood's heyday to Eureka. Restoring the apartment will run around $25,000 and volunteers have begun the sprucing up. 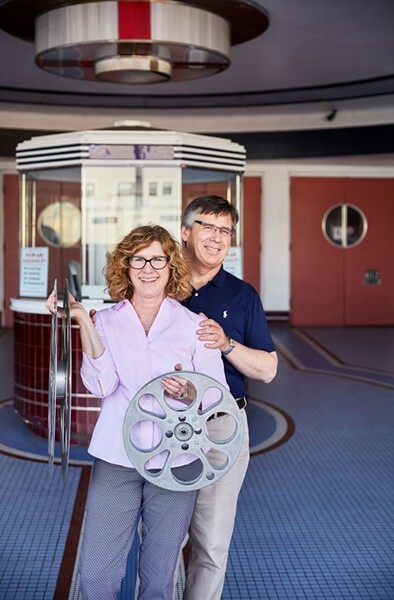 The Pettys are betting that their team of passionate volunteers — and the whole community — will support moving back-to-the-future with the Eureka Theater as downtown's flagship. 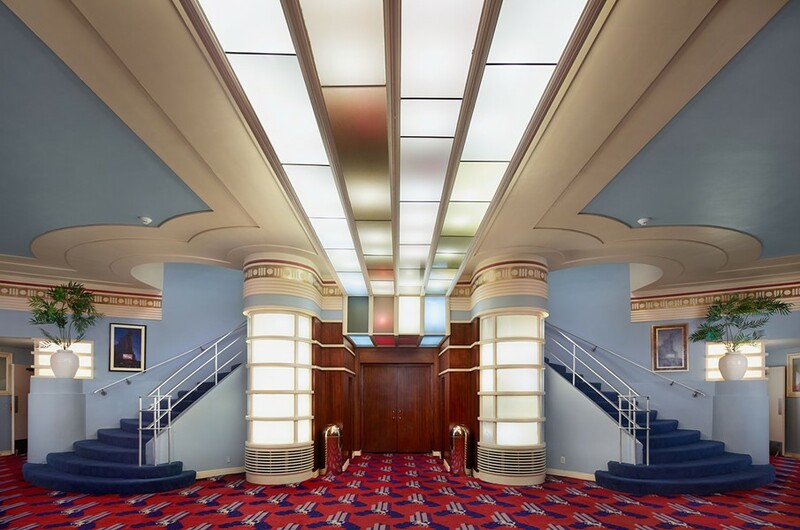 Recent improvements include transforming the candy counter into a rounded Streamline Moderne mahogany-and-aluminum cocktail bar and restoring the upper lobby ceiling's 1939 aluminum leaf paneling. Past management had painted the ceiling purple — Eureka artist Peter Santino refinished it with hundreds of aluminum plates. The place is starting to look like Spencer Tracy might walk in with Bette Davis on his arm. "It's an important building and it needs to be saved," says Wendy. "It really is the people's theater."